Balangir BJD MP Kalikesh Narayan Singh Deo has demanded setting up of a medical college at Balangir in vie of the Union Government’s decision to establish 60 medical colleges in the country during the period from 2012 to 2017. He, in a letter to Prime Minister Manmohan Singh, has urged him to consider the request for medical college keeping in view the backwardness and poor health service facilities in this KBK region. Singh Deo has stated that as the Union Government has decided to allow Odisha four medical colleges out of the 60 during the Twelfth Plan period in partnership with the State Government, Balangir should be included in the list. Balangir is in the KBK region, where health conditions of the people are poor, he has pointed out. 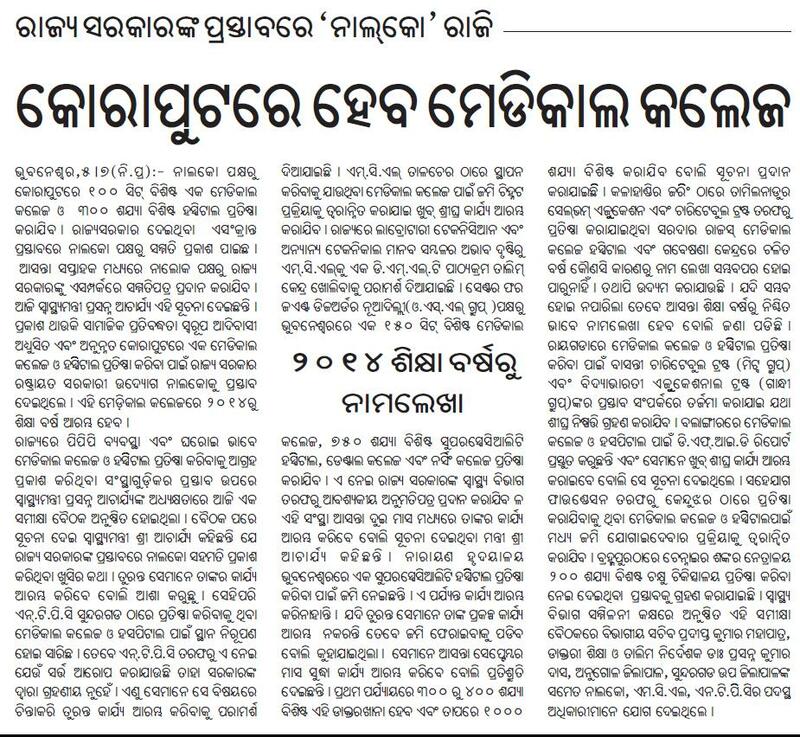 The Balangir District Headquarters Hospital is facing infrastructure inadequacies though a lot of improvements have been made by the State Government. With a large number of patients needing healthcare, setting up of a medical college at Balangir would go a long way in this regard, said Singh Deo. He has argued that setting up of a medical college would ease the severe shortage of medical professionals such as doctors and helping hands for medical care. Odisha has less number of Government medical colleges compared to the neighbouring States like Andhra Pradesh, West Bengal, Tamil Nadu, Karnataka, Kerala and Maharashtra, he has pointed out. In fact a medical college is more than an educational institution for local people in backward pockets. It serves as a hospital for secondary and tertiary health facilities providing better service and facilities for locals in backward region, he has further pointed out. It may be noted that though the State Government tried to set up a private medical college with funds from the Western Odisha Development Council (WODC), private promoters have been backing out from the project. Health and Family Welfare Minister Damodar Rout on Friday demanded 100 per cent support from the Central Government for setting up of four new medical colleges in the State. Rout pressed the demands before the Centre while attending a two-day meeting of Health Ministers and Secretaries from all States convened by the Union Health Ministry in New Delhi. Highlighting the development in the health sector of Odisha, Rout sought more Central aids for different programmes being implemented in the sector. Expressing grave concern over the health condition of primitive tribals and their low population growth rate, he advocated for greater focus on the tribal dominated districts, particularly the Kalahandi, Balangir and Koraput (KBK) region where both infant mortality rate (IMR) and maternal mortality rate (MMR) as well as mortality and morbidity rates are high because of incidences of various diseases, especially malaria and diarrhoea. Rout also drew the attention of the Union Health Minister for opening of Regional Geriatric and Cancer Centres in all the Government medical colleges and sanctioning more ANM and GNM training centers for the State. Further, Rout urged the Central Government to increase its share in the National Rural Health Mission (NRHM) and reduce the State’s share from 25 per cent to 15 per cent. Health and Family Welfare secretary Pradeepta Kumar Mohapatra and Mission Director of NRHM (Odisha) Dr Pramod Meherda attended the meeting. BHUBANESWAR: In good tidings for aspiring medical students, Odisha is all set to have four new government medical colleges, reducing the competition for admission into MBBS to some extent. In a new experiment, the Union government is planning to open over 60 medical colleges across the country in partnership with the state governments during the 12th five year plan period (2012-2017). The Union government would fund 75% of the cost while the respective states will bear the rest 25%. Sources said the Centre has responded favourably to a proposal of the Odisha government to open four colleges in the state. A senior state government functionary said the Centre has already given its on-principle nod to the proposal. The medical colleges would have 100MBBS seats each to begin with, he said. Confirming the state’s move, health secretary Pradipta KumarMahapatra told TOI, “We have proposed to convert four district headquarters hospitals into medical colleges under the new plan. 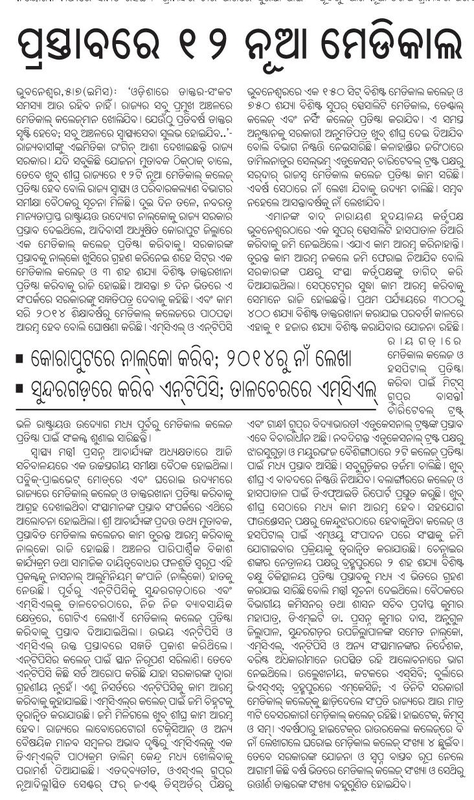 We are hopeful the plan will materialize.” Mahapatra said the government will select the four district hospitals in due course of time. Government sources said availability of MBBS seats will substantially increase from next academic year irrespective of the fate of the proposed four new colleges. The government is planning to add 100 MBBS seats in SCB Medical College from 2013-14. The government has already sought the permission of the Medical Council of India for the hike. At present, there are 500 MBBS seats in government sector in the state. These include 150 MBBS seats each in the three state-government run colleges: SCB, VSS Medical College and MKCG Medical College and 50 MBBS seats in the Union government-run All India Institute of Medical Sciences (AIIMS). After increasing the seats in SCB to 250 from next academic year, the state is also planning similar increase in seats in the two other colleges in subsequent years. Similarly, the Union government has announced to increase the MBBS seats in AIIMS to 100. In private sector, there are 400 MBBS seats at present, 100 each in the four private medical colleges including three in Bhubaneswar and one in Rourkela. The private sector seats are likely to go up by another 100 from next year when an upcoming private medical college at Jaring in Kalahandi district starts admission. BHUBANESWAR: Public sector undertaking Nalco promised the state government on Thursday to open a 100-seat medical college and 300-bed hospital in tribal-dominated Koraput district. This raises the number of medical colleges in the pipeline in the state to 12, including three by PSUs. “Responding to the government’s proposal, Nalco has come forward to establish a 100-seat medical college in Koraput as part of its corporate social responsibility. The company will submit its detailed proposal to the government within seven days,” health minister Prasanna Acharya said. While National Thermal Power Corporation ( NTPC) is in the process of starting a medical college in Sundargarh, Mahandi Coalfields Limited is planning one in Talcher. “Land identification and alienation for the MCL college will be done at the earliest,” the minister said after reviewing various proposals of establishing medical colleges in the state. To meet the shortage of laboratory technicians in hospitals, the government has also requested MCL to start a DMLT training centre. New Delhi-based OSL Group’s Centre for Joint Disorders will established a 150-seat medical college, 750-bed super-speciality hospital, a dental college and a nursing college in Bhubaneswar. The group has promised to start work within two months, the minister said. The upcoming Sardar Rajas medical college and hospital at Jaring in Kalahandi district, being established by Selvam Education and Charitable Trust of Tamil Nadu, will start admitting students from the next academic year, the minister said. The sDFID of UK has been preparing a report to facilitate a medical college in Balangir. Similarly, land transfer work for the proposed medical college by Sahyog Foundation in Keonjhar will be fast-tracked, the minister said. Acharya said the government would soon examine the proposals of Basantidevi Charitable Trust and Bidyabharti Charitable Trust as well to open a medical college in Rayagada. The government has also agreed in principle to a proposal from Shankar Netralaya of Chennai to start a 200-bed eye hospital in Berhampur. The government on Tuesday asked Bangalore-based Narayana Hrudayalaya, which has taken land from the state government to establish a super-speciality hospital in Bhubaneswar, or start work or return the land. The group assured to start work by September. The State Government in the Department of Health and Family Welfare on Saturday asked the district authorities of Kalahandi, Kandhamal, Sundargarh and Dhenkal to start preliminary work for construction of four General Nursing and Midwifery Training Schools in those districts at a cost of Rs 10 crore each. Out of the required Rs 40 crore, the Central Government has agreed to release 85 per cent and the State would have to bear 15 per cent. The Government has made budgetary provision of Rs 6,22,72000 in the Budget for 2012-13, according to Minister of Health and Family Welfare Prasanna Kumar Acharya. Besides, the Government has aldo directed the departmental authorities in Nabarangpur, Boudh and Subarnpur to accelerate the process of completing the GNM Training School and two ANM Training Schools under construction in the districts, respectively. The Centre has released Rs 4.75 crore out of a total of Rs 17 crore. The State Government has also released Rs 1 crore while another Rs 3. 33 crore has been laid out in the current year towards the State’s share. 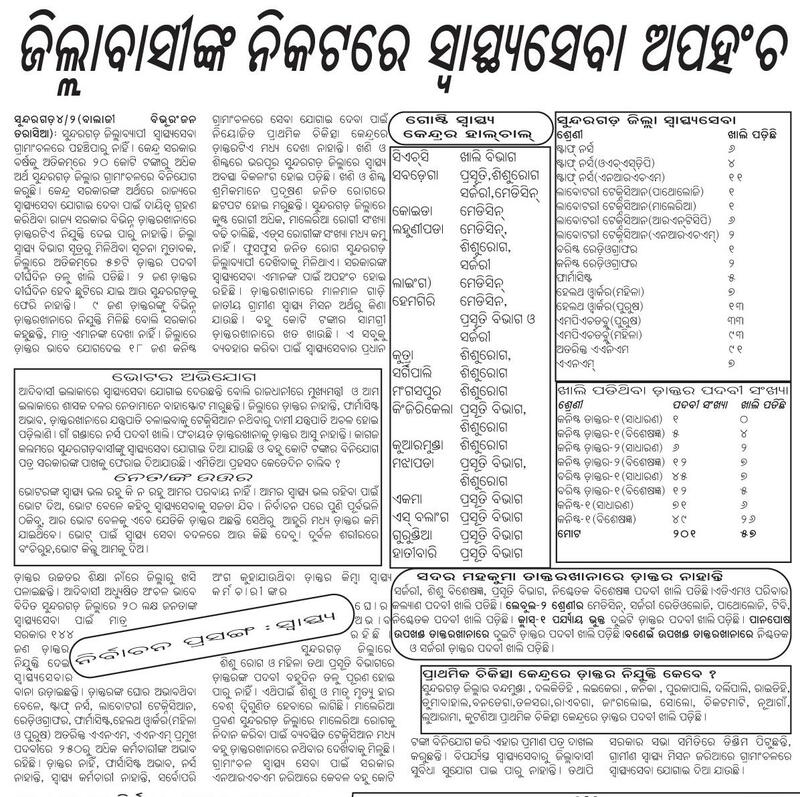 Besides, the Government has created posts of one principal, 14 tutors, one junior clerk one librarian, one laboratory assistant and two peons for the Nabarangpur GNM Training School, posts of one principal tutor, five tutors, one junior clerk and two peons for the the ANM Training Schools each at Boudh and Subarnpur have been created.